Ginger is used in a number of different cuisines, particularly dishes from India and throughout much of Asia. 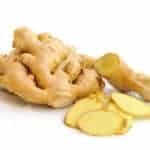 Also, this root has been used for centuries, and it has made significant inroads into Western cuisine thanks to its amazing taste, but also to its myriad health benefits of ginger. It’s been dubbed a “superfood” for many good reasons. What we call ginger is actually the root similar to wasabi in this case. Or underground stem (rhizome), of a plant. And it is native to India, China and Japan, and is actually part of the same family as turmeric. It can be sliced, chopped, ground, powdered and juiced depending on the use intended (food, beverages or for medicinal needs). It’s hot, spicy, aromatic qualities make it a prime addition to any number of different dishes and beverages. It is also used for a number of health problems. While fresh ginger is not known for causing side effects, some people do report that it increases the incidence of acid reflux for them. Per 100 grammes, ginger also offers 17.77 grammes of carbohydrates, 2 grammes of dietary fibre, 1.82 grammes of protein and 1.7 grammes of sugar. With it only containing 13 mg of sodium. While ginger can be consumed on its own either for the taste or for a medical purpose, it is generally added to liquids and foods. It pairs very well with a number of different food types, including citrus fruits and seafood. It is also good with pork dishes, with apples and much more. Also, the root works particularly well in smoothies, especially those with citrus fruits incorporated, as well as in stir-fry dishes, in apple-based beverages and in fish dishes. It is always recommended that fresh ginger is used, as this allows you complete control over its use and ensures there are no fillers or binders used. When choosing ginger, look for roots that are smooth and wrinkle-free. Due to the root ageing, it begins to lose moisture, which shows the wrinkled skin on the outside of the root. Choose unwrinkled, smooth, firm roots that have little flexibility (bendable roots are usually dry and lack flavour). Also, the aroma should be spicy, or “hot”. Ground ginger is used in many dishes. If you choose to purchase pre-ground ginger rather than grinding your own, buy from a trusted brand. Also, the general equation is one-eighth of a teaspoon ground for every one tablespoon freshly grated.